Throughout my time with Darkest Dungeon, I was almost constantly on edge. Every step was filled with trepidation. No matter how strong my team became, how confident I was in our chances, I always felt like I was one misstep away from failure. No matter how many victories I accrued, that lingering fear never ceased to follow. That’s because your adversary in Darkest Dungeon isn’t the monsters that lurk behind the shadows, but stress. You take on the role of a caretaker of a small hamlet you inherited from your late ancestor. He had a fascination with the occult, however, and in his pursuit to understand and harness the secrets of the ruins hidden beneath the family estate unleashed a menagerie of eldritch horrors onto the land. And as the new caretaker of the estate, it’s on you to clean up his mess and restore your family’s reputation. You recruit a band of heroes of various disciplines and head forth into one of four locales to try and quell the dangers within. You move through randomly generated dungeons moving between rooms, grabbing whatever gold, trinkets, and heirlooms you find to help fund your continued expeditions. Your objective is usually to either defeat all enemies or survey 90% of the area. As you explore, your team slowly builds stress, which affects their mental well-being. If the meter fills, they receive an affliction that hinders their performance in combat. They become abusive or fearful, criticizing fellow party members for their actions in the case of the former or start sobbing uncontrollably in the case of the latter, both causing additional stress damage to the rest of the party. Build too much and they’ll suffer a heart attack and either be pushed to death’s door or killed outright. 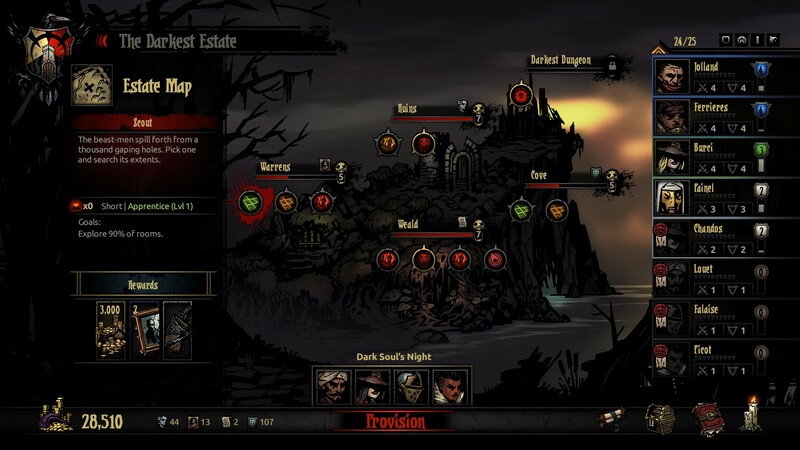 The stress mechanics are the hook of Darkest Dungeon. Just keeping your party’s hit-points up isn’t enough to ensure their safety. Enemies attack by dealing stress damage as much as they do physical and is arguably more dangerous since stress cannot be healed as easily. Scoring critical hits, examining certain objects in the tunnels between rooms, and camping help calm your heroes’ nerves mid-quest, but even those are hardly guaranteed methods. The curiosities you examine are unpredictable, sometimes granting strength and other times inflicting disease. Critical strikes are sparse and relieve only the tiniest bit of stress upon a successful hit. And camping is only available on medium length dungeons or longer, which only makes whatever stress you can relieve a temporary respite. The only way to remove stress effectively is to pay for your soldiers to have some time off and relax. Whether that’s by having them drink or partake in gambling at the tavern or meditating or engaging in flagellation at the abbey is up to how much coin you’re willing to spend and what activities your heroes prefer. Combat is a turn-based affair. The formation of your heroes is key. It dictates what skills they can use and which enemies they can attack. Positioning is everything and a formation thrown into disorder can spell disaster. Archers being pulled to the front leaves them vulnerable and unable to act, as all their skills require them to be in the back row. Likewise, a knight pushed to the back of the line is of little use to your party since they can’t effectively draw and deal damage. Enemies can and will use whatever tactics they can to throw your line into disarray and leave you scrambling to quickly restore order. But the same be done to them as well. A direct assault won’t get you very far, so you quickly learn to formulate strategies for each foe and make the most of your party’s skills. Throw a plague bomb to infect the enemy archers to kill them slowly while you chip away at the front line. Reshuffle their own formation to bring their weaker units up front to quickly be crushed and clear any corpses from the field. Afflictions like blight and bleed are especially important because every bit of additional damage you can deal makes a big difference. Most of the boss battles came down to me stacking bleed and blight damage since I was often spending most of my time trying to keep everyone else alive that I couldn’t do much else. It was slow, but it got me through most fights with relative ease. Darkest Dungeon isn’t always so merciful, though. I can’t count the number of expeditions that suddenly ended in disaster due to a few unlucky rolls. The worst was when I lost a couple of Vestals (the healer class) in two separate instances just as I was getting them ready to take on the final dungeon. Each started off fine: battles were a breeze, everyone was scoring critical strikes regularly, and I was getting tons of cash. But then, out of nowhere, things went utterly awry. A couple of ambushes and a surprise mini-boss encounter decimated my team. My Vestals were gone and so were a few other pillars of my crew. Gone were my hopes of tackling the titular Darkest Dungeon one last time, the end slipping from my grasp once more. I felt tempted to quit whenever I encountered such rotten luck. No matter how careful you are, however, there’s no guarantee everything will work out. Even with the best weapons and skills, trinkets to boost their strength and defense, and all the supplies you can buy, you can still easily fail. All it takes is one miscalculation, one bad decision to throw a solid run into disarray. I hesitate to say it’s random, since you can clearly and easily finish excursions with nary a scratch, but luck is definitely involved. Attacks can miss at a crucial moment; enemies can score multiple critical hits in a row; surprise boss encounters can destroy you almost instantly. When those misses are the difference between life and death, it’s infuriating to see your attacks fail to connect. It’s that element of chance that instills stress in the player as much as the characters. I could never play Darkest Dungeon for long because it’s a very draining game to play. Every expedition I sent my heroes out on left me exhausted. Knowing that things could go south at any moment filled every step with trepidation. One ambush, one hero investigating the wrong curio, one trap going off was all it could take to throw a perfectly sound run into disarray. I’d worked out enough tricks to lower my chances of poor luck – keep the torchlight high to decrease the chances of an ambush, take people with high scouting chances for the particular zone I’m exploring to know what’s coming, and making sure everyone’s skills and equipment were fully upgraded – but even with those safeguards, nothing was guaranteed. The hardest part of Darkest Dungeon is knowing when to back down and retreat. As your team grows stronger and the success rate of your quests increases, it becomes far too easy to keep pushing through a losing battle in the hopes that you can turn it around somehow. Even if the odds are clearly against you and there’s no hope of survival. Almost all my losses can be attributed to such hubris when I should been smart just take the loss. But it’s hard when you really, really need those rewards. Abandoning quests means you don’t get anything. Gold is hard to hold onto for much of the game, forcing you to scrape by with what little you find packed away in chests and pick up off corpses. Giving up on a quest that rewards a handsome amount of cash can mean the difference between being able to afford funding another expedition or not. Retreating also means you don’t gain any experience. When you’re trying to refill holes in your roster quickly, that can prove troublesome. For the longest time, I never felt like I could keep up with the difficulty ramp. I was always tackling higher level quests with underpowered gear and skills because I couldn’t afford them, which in turn led to many failures because I couldn’t reliably combat stronger foes. Progress was slow, but that only made every small step forward that much more rewarding. Eventually I was more than well-equipped to tackle whatever the game decided to throw at me. But even that didn’t mean much in the end. The last couple runs through the final dungeon were rife with close calls, victory hinging on a single soldier. By all accounts, I should have failed. The odds were stacked against me: it was one person against a boss that could easily destroy me. I was as good as dead. But I won. Somehow I’d managed to beat the odds was able to move straight to finale. After a hundred hours of such stressful encounters, I was spent. 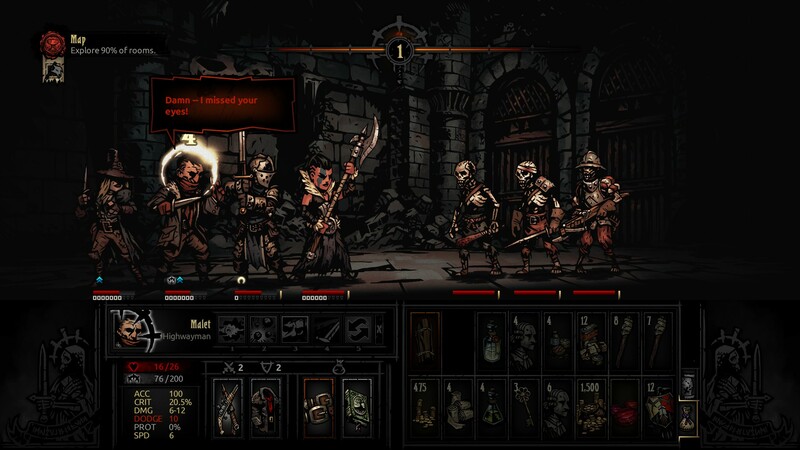 Darkest Dungeon is a game of many highs and lows. While the lows are utterly crushing, the highs are intoxicating. It’s a long, brutal game, but a greatly satisfying one as well.